Jada is an avid bow hunter out on vacation during elk season with three of her friends when they are viciously attacked by strangers. One of her friends is killed outright and two others are taken captive. She wants to be with them, fight beside them, but another stranger arrives and pulls her aside, blocking her path back to camp as she listens to her three friends scream. Has Jada been saved by this stranger? Will she be able to save her friends, or will she join their fate? Denna Holm, the mind behind Jada’s adventure has kindly set aside a little time to delve into ‘Dark Warrior’ an instalment from the Immortal Warriors series today. Denna, what inspired you to pen this particular tale from the Immortal Warriors world? The idea for this story came about because of my husband’s love of bow hunting. I thought why not have a story featuring four women hunters? I can’t say that I’ve met any female hunters personally, but with your husband’s love of bow hunting you may have. Were experiences with female hunters used to develop these women? Actually, Jada is the strong woman that I’d like to be. Oh, I like the idea of building a character from your own desires. What a great idea! Did you also merge in any life experiences alongside these desires to add more depth to this novella? Yes, I used my own experiences in the wild to help try to give a realistic view of the setting. Once you’d combined these snippets of realism with the characters in the Immort Warriors world, what did you feel was the most important point that your characters had to share with the readers? That with determination we can overcome any hardships thrown our way. And the best way to overcome those hardships to learn new things to focus determination onto the task at hand. So, what did you learn when you were recording the plot? I’ve always written full-length novels. It was a learning experience to figure out how to tell a story using half the space. From the reader’s comments, I think it’s clear that you have excelled at sharing a story in half the space. So, what you were thinking about each time you sat down to write as you were in the midst of this challenge? I’m always thinking about where I want my characters to end up. If someone starts out frightened or weak, I want to see them grow. And as your characters have grown I’m sure your own skills as an author have as well. As you look back on your work, do you personally feel that you’ve progressed as you’ve kept writing? Oh yes. It was a struggle to find my own voice in the beginning. At this time when you were struggling with your author voice, did you also find yourself struggling to come up with ideas for a story? Rarely. Sometimes the plot or characters switch gears on me halfway through a story. Those pesky characters changing their minds. They do like to make it difficult! Well, I hope they’re all behaving themselves at the moment in your current writing projects. What can you share about what you and your characters are currently getting up to? I am currently working on two science fiction romance series. I’m finishing up the sixth in the Immortal Warriors series and the third in Raiden Warriors. Wow, that’s quite a lot of projects that are underway. And as I don’t want to kept you from your characters any longer, I think this is a great place to end our chat today. Denna, thanks so much for sharing a taste of Dark Warrior today, and I wish you the best of luck with the next chapter in the Immortal Warriors series. Excited to read the book we discussed today? Find it here on Amazon: ‘Dark Warrior (Immortal Warriors novella) ( ASIN: B06ZYV28DT )‘. 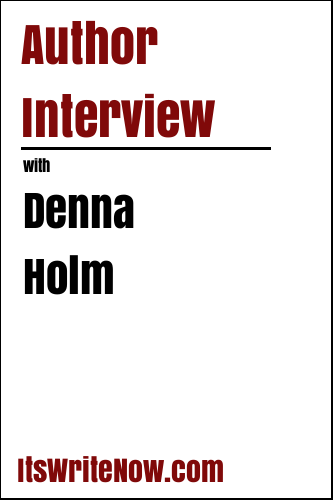 Want to find out more about Denna Holm? Connect here!